Music Stand's builtin Metronome makes it easy to keep tempo. Each song has its own tempo & meter and they change as you switch songs. You can also turn on a visual Flash to see the beat peripherally. 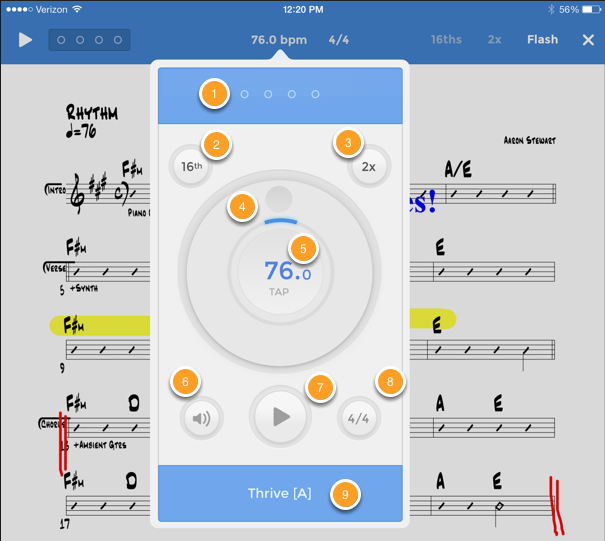 Tap the the screen to show the toolbar, then tap the metronome icon to enter the metronome toolbar. Play -Start or Stop the metronome. It will continue even if you close the toolbar or the app and will change settings as you change songs. Beat Indicator -Circles appear for each beat in the chosen meter (see #4) and pulsate when the metronome is playing. Tempo -The tempo of the current song. Tap to view the popup metronome to change the tempo and edit other settings. Meter -The meter of the current song. Tap to change. 16ths -Tap to turn on sub-divided 16th notes. This is usually helpful for slower tempos. 2x -Tap to double the speed of the metronome sound. When on, a song at 60bpm will sound like 120bpm. Flash -Tap to turn on the flashing toolbar. The entire blue toolbar will flash to the beat. This is useful if you keep the toolbar visible at all times, and especially if you don't want to be staring at your music all the time, but want to see the beat peripherally. Close -Tap to close the Metronome toolbar and return to the regular toolbar. Tap the tempo in the center of the Metronome toolbar to open the popup Metronome to adjust the tempo & change volume & sound options. Beat Indicator -Circles appear for each beat in the chosen meter (see #4) and pulsate when the metronome is playing. This matched the Beta Indicator in the toolbar. 16ths -Tap to turn on sub-divided 16th notes. This is usually helpful for slower tempos and is the same option as in the toolbar. 2x -Tap to double the speed of the metronome sound. When on, a song at 60bpm will sound like 120bpm. This is the same option as in the toolbar. Tempo Wheel -Rotate the tempo wheel to adjust the speed of your song. Rotating quickly will adjust the tempo in whole numbers and moving slowly will allow you to adjust in decimals. Tap Tempo -Tap the center of the metronome and the tempo will be calculated. Sound Settings -Adjust the volume of the audio player, metronome and change what sounds the metronome uses. See below. Meter -Set the meter of the current song. Tap the Volume icon in the full metronome popup to enter the Sound Settings screen. Metronome & Audio Player Volume -Adjust the Metronome or Audio Player volumes in relation to each other if you are trying to play audio and the metronome at the same time and are having a hard time hearing one over the other. These do not adjust the Master iPad volume which can only be adjusted using the buttons on the side of the iPad. 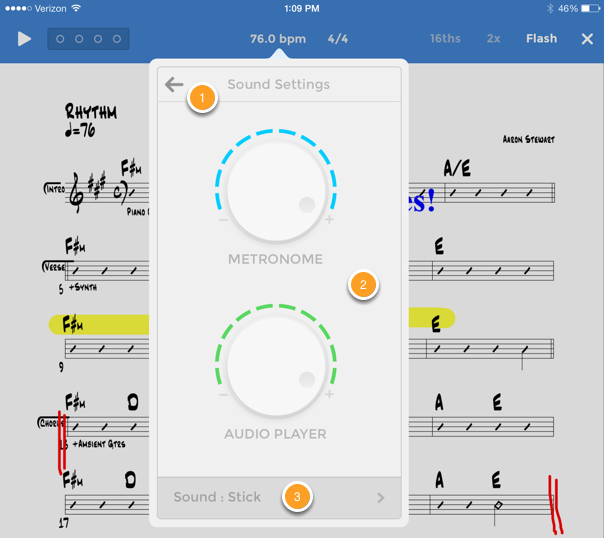 Sound Options- Tap to change which sounds the metronome should use and to turn off the accent on the downbeat. Tap the Sound Options button on the Sound Settings screen to adjust Sound Types & Accent Downbeats. Back -Tap to return to the Sound Settings screen. 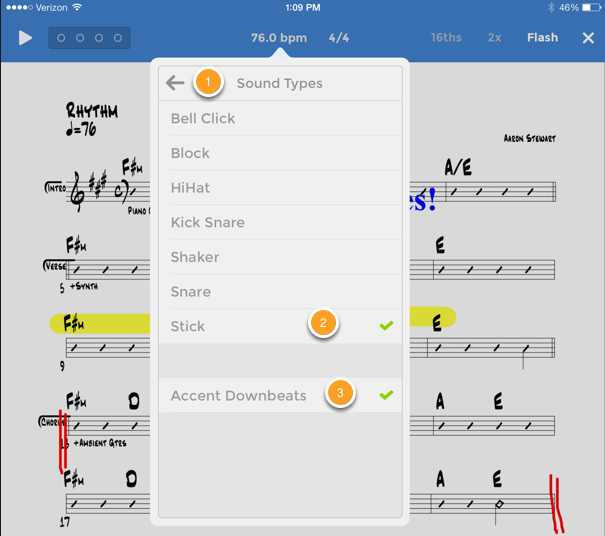 Accent Downbeats -Uncheck to prevent the metronome from playing the downbeats louder than the sub-beats.